Mark Rothko: The Dark Paintings 1969-70, The Pace Gallery, New York, 1985, unnumbered catalogue, repro. New York: A Magnet for Artists, Toyko Metropolitan Art Museum, 1994, no. 122, repro. Mark Rothko, National Gallery of Art, Washington, D.C.; Whitney Museum of American Art, New York; Musée d'Art Moderne de la Ville de Paris, 1998-1999, no. 67 (Paris cat. ), repro. (shown only in Paris). Monet y la Abstracción [Monet and Abstraction], Museo Thyssen-Bornemisza, Madrid, 2010, no. 11, repro. Mark Rothko, Portland Art Museum, Oregon, 2012, no catalogue..
American Paintings: An Illustrated Catalogue. 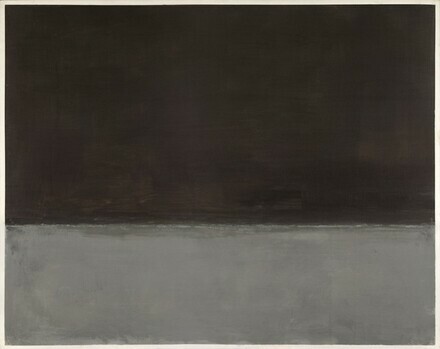 National Gallery of Art, Washington, 1992: 328, repro. Richler, Martha. National Gallery of Art, Washington: A World of Art. London, 1997: 198, color fig. 14. Anfam, David. Mark Rothko: The Works on Canvas: Catalogue Raisonné. New Haven and London, 1998: no. 823, repro.